OSP EXPO, Booth 919, Cincinnati, Ohio, September 12, 2011 - OFS, a leading designer, manufacturer and supplier of innovative fiber optic network products, has introduced a new 432 fiber distribution cabinet (FDC) at the 2011 OSP EXPO this week in Cincinnati, Ohio. The 432 FDC continues OFS’ cabinet architecture strategy of compact size, easy provisioning and slack management for rapid deployment. This new FDC combines simplified fiber routing management with OFS’ DirectConnect splitter which allows incremental usage of splitters to reduce congestion while accommodating a “grow as you go” buildout. The 432 FDC can be fitted with either SC or LC/ APC connectors on the splitter leads, and uses OFS’ bend-optimized AllWave® FLEX Zero Water Peak (ZWP) fiber to minimize bending loss. 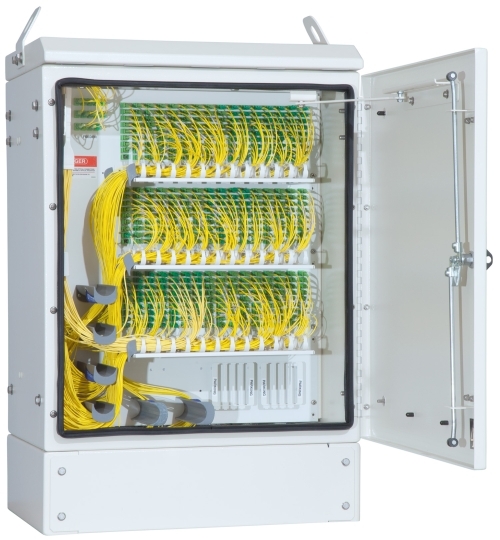 Additionally, the FDC can be ordered with an optional patch panel to enable easy provisioning of up to 10 customers requiring dedicated point to point connections. OFS is a world-leading designer, manufacturer and provider of optical fiber, optical fiber cable, FTTX, optical connectivity and specialty photonics products.